If you’re in the mood for something a little more “sampley” tonight, you’re in luck. Girl Talk can be very polarizing. People seem to either love him (and we do mean love), or they seem to utterly loathe him. Those in the camp of loathing argue that Girl Talk (aka Gregg Gillis) is simply capitalizing on the work of other artists. Those who love him mostly just like to dance. We’re somewhere in the middle. Sure, the guy is pretty much a glamorized DJ, however there’s something different about Gregg. He has the most finely tuned ear for mashups that we’ve ever heard. To recognize all the different samples he uses in his frankensteined masterpieces, you have to be familiar with a wide range of different music, from hip hop to classic rock to punk to R&B to funk to modern day alt rock. 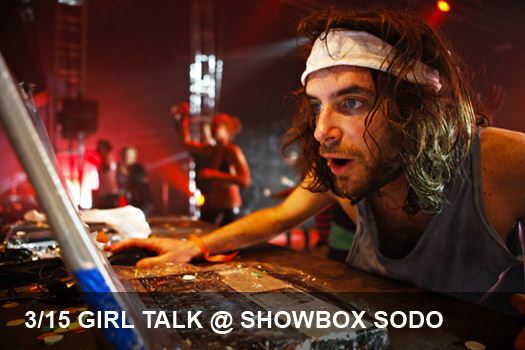 Girl Talk breaks boundaries between different musical genres and turns all of our culture’s music into one giant dance party. And we suppose that is something to appreciate.